Philips OLED804 / OLED854 hands on review | What Hi-Fi? The 2019 Philips TV range is compelling for a number of reasons. There's Dolby Vision and HDR10+ on 90 per cent of models, a new LCD model with Bowers & Wilkins sound, and a budget TV with the Alexa assistant built-in. But it’s undeniably the 2019 Philips OLEDs that are most compelling to us and, in all likelihood, you. Those new OLEDs are the OLED804 and OLED854, which will both be available in 55in and 65in sizes (model numbers will be 55OLED804, 65OLED804, 55OLED854 and 65OLED854). These new models will replace last year's excellent OLED803. We understand that there will be a replacement for the B&W-tuned OLED903, too, but it’s as yet not been announced. And we have high hopes for these TVs. After a shaky, software bug-addled launch, Philips’ 2018 OLED TVs established themselves as arguably the most compelling alternatives to the LG OLEDs with which they share a panel. That’s quite the feat for what is, with the greatest respect, a comparatively small, European brand (even one with Chinese investment). And it’s one that the company is keen to repeat or even improve upon in 2019. The only difference between the OLED804 and OLED854 is the stand. The OLED804 gets dainty, angular feet that keep the screen very low to the ground, much like those of last year's OLED803, while the OLED854 has a more typical-looking pedestal stand, albeit one that swivels. Philips thinks, in fact, that the OLED854 might be the first OLED available with a swivel stand. Above the stands, the chassis are the same and similar to that of the OLED803. Ultra-thin bezels mean you see little from the front but screen, and the panel itself is as slim as we’ve come to expect from OLED tech. The plastic section attached to the back of the panel, which houses the TV’s connections and electronics, is, as before, chunkier than that of many rivals, but that’s because it also houses the LED strips that form Philips' familiar Ambilight system, which extends the image on the screen to the wall around the TV using coloured light. All of Philips' 2019 TVs that have Ambilight, which is the vast majority of them, have Ambilight 3, which creates light on three sides - left, right and top. Philips says it’s now moved away from four-sided Ambilight as underside speaker placement and pedestal mounting points make it an engineering nightmare - an engineering nightmare that’s under-appreciated due to the low proportion of European TV buyers who wall-mount their TVs. Besides, Philips now offers another solution for those who want some Fast and Furious-style under-lighting for their TV - the new Hue Play light bar. This can be set to synchronise with the TV’s Ambilight system in real-time and the brief demo we saw of this was very impressive. 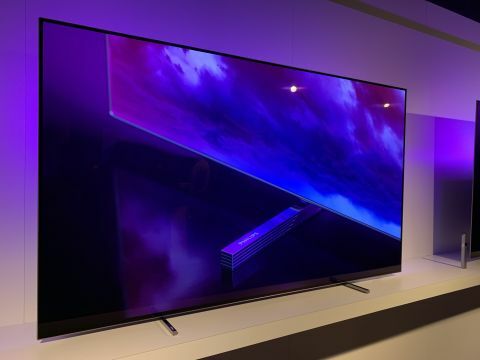 Interestingly, there was no mention of HDMI 2.1 during the 2019 Philips TV launch. That could be because its new models are all HDMI 2.0, but it’s just as possible that uncertainty around the certification process means Philips genuinely isn’t sure whether HDMI 2.1 will be an option by the OLED804/854’s release date. There was similarly little information proffered in regards to the app selection of Philips’ 2019 TVs. We’re taking that as evidence that the company is once again relying on Android TV’s built-in selection of apps, rather than taking the top-up approach adopted by Sony. Which is to say that we’re now not expecting the OLED804 or OLED854 to feature ITV Hub, All 4 or My5, although we’d be delighted to be surprised. What Philips is talking about a great deal, is the new, third-generation version of its P5 processor which, according to the company, brings with it a 20 per cent increase in overall picture quality compared to the second-generation P5 in the OLED803 and OLED903. Specifically, Philips is talking up improved noise-reduction, greater detail and sharpness, better colours, and an HDR performance with more dark detail, less clipping (washing-out) of colours at the brightest end of the spectrum and reduced banding. On top of all that, Philips, which already supported HDR10+ in 2018, is adding Dolby Vision for its 2019 sets (no, the OLED803 and OLED903 will not be getting a Dolby Vision software update), which means HDR in all of its forms and flavours is on board these new TVs. That said, we couldn’t get HDR of any kind to work via Amazon Video or BBC iPlayer on last year's sets, so here’s hoping Philips also updates its apps to take advantage of the enhanced HDR format support. Speaking of Amazon, Philips has announced that all of its Android TV sets will be ‘Works with Alexa’ certified on top of the built-in integration of Google Assistant. Voice control will still be of the ‘push-to-talk’ via the remote kind, with Philips saying that its experiments with always-listening microphones built into the TV itself produced too many errors. Of course, if you want to go hands-free, you can always use an Alexa or Google Assistant smart speaker to issue commands to the TV. There are always limits to the conclusions that can be drawn from a manufacturer-led demo of its own technology, but the Philips OLED804 looked undeniably lovely during our hands-on session. The panel is the same as last year, but the new processor appears to bring with it across the board improvements. The image is subtly more vibrant, purer in its whites, more colourful and nuanced in the brightest areas and more detailed in the darkest. Blacks are probably just a little less deep overall than those of the OLED803, but there’s no sense of the image being washed-out, and the extra dark detail appears to be ample compensation for the slightly less dramatic black depth. What’s more, the extra colour vibrancy and white punch means the picture is actually more dynamic and enticing as a whole. All of this combines with sharper, more defined edges, and creates an image that pops from the screen far more than last year’s model. A clip from The Christmas Chronicles made it look almost as if Kurt Russel’s Father Christmas was leaning out of the screen on the OLED804, while he seemed far flatter and more contained on the OLED803. Philips is also clearly proud of what the new version of the P5 can do with content that isn’t 4K or HDR, and the comparison between the OLED804 and OLED803 was near-revelatory in terms of the new model’s combination of noise-reduction, enhanced sharpness and greater punch. Again, it was the overall solidity and lifelikeness that were most impressive. Philips also seems to be very proud that it’s managed to persuade Dolby Vision to allow the P5 to implement motion processing while in the Dolby Vision picture mode, but it’s much harder to see why. In the very brief demo the motion was clearly, unpleasantly over-processed. What’s more, while most Dolby Vision TVs by default have motion processing switched off when watching Dolby Vision content, there’s nothing stopping you switching it back on. In short, this seemed an odd aspect of the OLED804’s performance to highlight, particularly as, on this brief evidence, the motion processing itself doesn’t seem great. We didn’t get to hear the OLED804 during the launch event, with the sonic focus being on the B&W-fettled 8804 LCD and Philips’ new audio range. As mentioned, the OLED804 and OLED854 do without B&W’s involvement but they do get Dolby Atmos, as do most Philips 2019 TVs. Whether that turns out to be any more than some software tweakery and a fancy badge remains to be seen. While the OLED804 and OLED854 may not appear to be a huge step forward over the OLED803 on paper, our early demos suggest the upgrade is noticeable and worthwhile. Improvements to black detail, colour vibrancy, sharpness, and white purity create an image that is clearly more dramatic and three dimensional. Add additional support for Dolby Vision and you’ve got a compelling upgrade over the outgoing - and already excellent - OLED803. That said, it’s impossible to draw firm conclusions from a brief session such as this, and we don’t yet have a price or release date for the OLED804 or OLED854 (it’s not actually a given that both will come to the UK), but early signs are that, if the price is right, these could be real Awards-contenders this year.